My son is going to be a lumberjack for Halloween, but I needed a axe. Calm down everyone! It is a plush axe from Freaky Fleece:) I could not have him running around with the real thing! That would be a trip to the emergency room in the making...for someone. Anyway, lucky for me Freaky Fleece carries plush weaponry! If you have little boys you need to visit Freaky Fleece! They have plush swords, shields, and crazy mustache pillows too(my personal fave). Your little boys can whack each other until the cows come home and no one bleeds.....perfect! :-) Please enjoy the still life footage of my son toting and chopping with his plush axe! 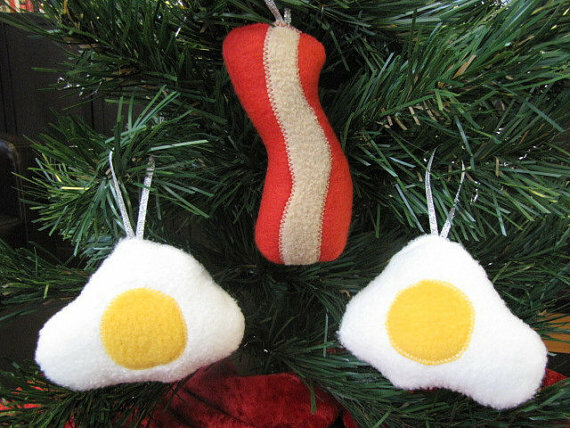 Bacon and Egg Ornaments...freaking awesome! Enough fleecing around...how about a lumberjack worthy Freaky Fleece giveaway!?! ?